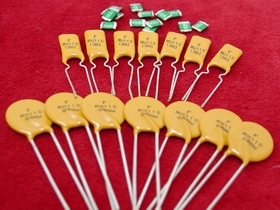 Polymeric Positive Temperature Coefficient Thermistor (PPTC) is made of crystalline conductive polymer composite material. In the normal working condition, the conductive fillers in the composite matrix form a continuous filler network and the resistance of the device is in the low resistance state. In the abnormal condition, the current flowing though the device is higher than the trip current, the device is heated up to a state that the connected filler network breaks down. Then the resistance of the device increases dramatically to the high resistance state and the current flowing through the circuit is reduced. Once the abnormal condition is reset, the device cools down, and the filler network connects again and the device returns to its low resistance state.